Pythagoras of Samos is sad to have asserted that “Everything is related to numbers”. In ancient times, he experimented on a one-stringed instrument to discover the ratio between notes and numbers. This interrelationship is still relevant today for the constructors at Schimmel: for example, when they calculate and develop for cast-iron plates for specific instruments according to stability and acoustic criteria. Nowadays, they employ high-tech software for this purpose which is also utilized in the aircraft construction industry. 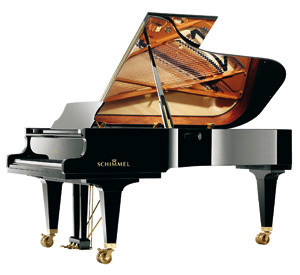 The almost 10,000 computer-controlled precision bore holes in the sounding body alone guarantee a fitting accuracy to a micron-exact degree in the acoustic element of the piano. This is precision work which makes a major contribution to the consummate sound of our upright and grand pianos!